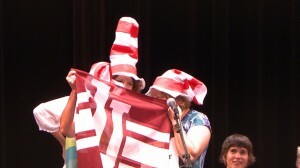 Laurie Burns-McRobbie and her teammates from "Spell Hoosier" decide how to spell a word during the first-ever Adult Spelling Bee to benefit New Tech High School. Spelling bees are normally contested by children; supporters of the Monroe County Community School Corporation held a bee for children at Bloomington’s Buskirk-Chumley theatre. The event was a fundraiser for Bloomington’s New Tech High school, with teams paying a $500 entry fee to compete. One by one, spellers walked to the microphone and had 20 seconds to decide how to spell the word they were given. If they were right, a crowd of well-wishers signalled its joyous support. And if they were wrong, The Bloomington Symphony Orchestra’s Paul Hartin offered a mournful dirge on his tuba. The final four teams were so close, a “spell-off” was declared, with each team given a white board and five words to spell. 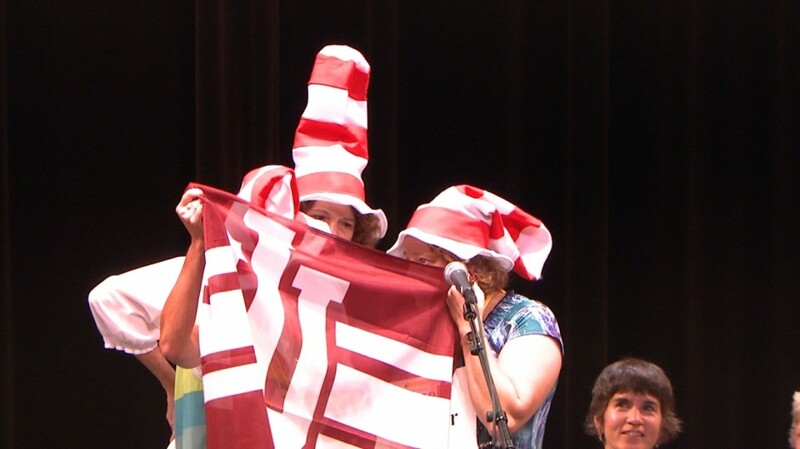 In the end, a team called “Spell Hoosier,” including Indiana University first lady Laurie Burns-McRobbie, spelled four of the five words correctly and was declared the winner. The team takes home a traveling trophy for it effort.